Very easy to setup. You just need to call one function in order to make the inventory system work! Easy to customize. 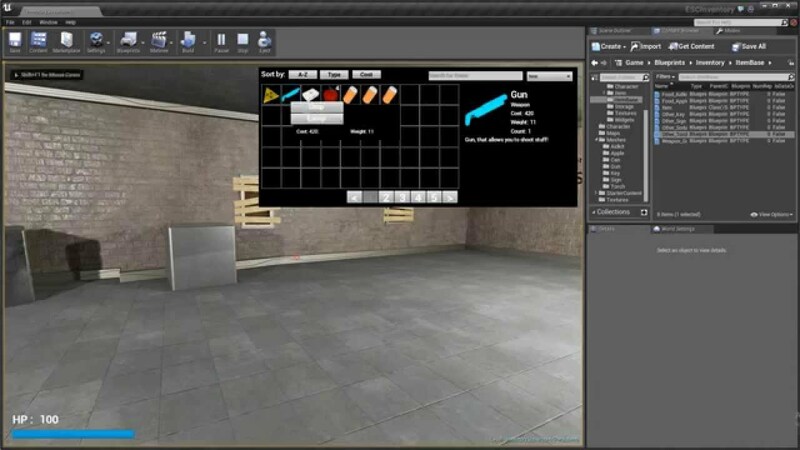 You don't have to understand Blueprint system, but still able to make the inventory you want and with any style. Page Navigation. You can set, how many pages will use your inventory. Filtering & Sorting. Supports Name search, Type filtering and some types of sorting. You can combine as well(Ex. I want to show only Weapons with "heavy" in their names, and sort them by value. I can!!). RMB Menu. You can press the Right mouse button on inv. slot, the small panel will appears, where you can drop items(Drop All & Drop Count, if slot have more than one item), use then and equip. Fast menu. Place important items right on the screen and use it by pressing 1-0 buttons. Limits. You can limit items by weight or by slot count. You can also combine this. !! !Preview project will also include Apple, Aidkit, Can, Torch, Sign, FPS Weapon(no hands) models. Those are made by me, so you can use it in your game. Some of item models made using CGTextures. Model and texture sources will be included. Beta! Expect some bugs. UE version: 4.7!! Hakabane - Thank him that my inventory is free. And helping me with English stuff. EpicGames - For making the best Engine in the world. Last edited by AlFlakky; 07-31-2015, 12:50 PM. Reason: Removed "WIP" from title. Wow. 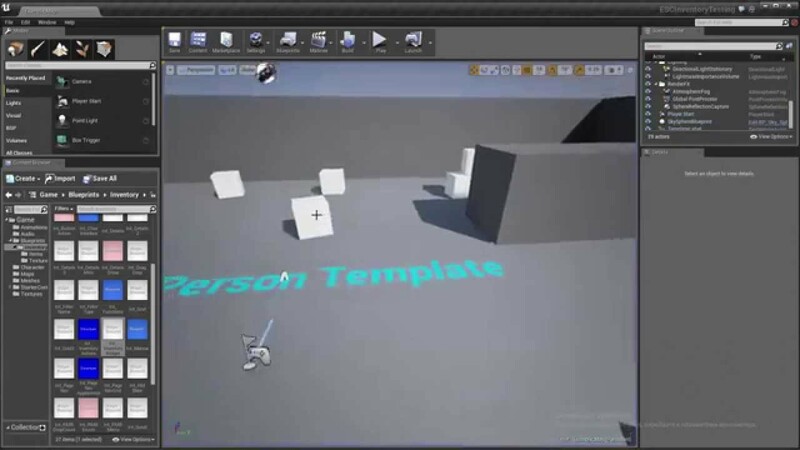 I was looking for bits and pieces of information on how to create such an Inventory System in UE4 a couple of days ago and BAM, this shows up. It looks awesome and 15 - 20 USD is a highly reasonable price range. Last edited by Maxunit; 12-16-2014, 07:34 PM. Im planing to finish it in January, and if everything will go well, going to submit it on market. Last edited by AlFlakky; 12-16-2014, 06:32 PM. Im not the best in design, but i wanted to make something very quick. The style setup took about 5 minutes, without messing with the code at all. By the way.. Yesterday I changed the way user can setup the inventory. Now its very easy, you just have to call macro function, wich enables the inventory, and then all you have to do, is edit UMG widget. Place inventory elements where you want them on the screen, press Play button and that's it, Inventory will work from that moment. Many functions aren't done yet, but Im going to make it as quick as I can. Hope u guys will support me and my work Thank you! Last edited by AlFlakky; 12-17-2014, 05:55 PM. Today I have been working on Drag and Drop system. Now its working and able to move stuff around. Weight Limit. Added weight information to items. Now when you try to take an item, it checks, if u have full, or almost full inventory. Yesterday i finished Use system, so devs can easily add functionality to their items. If item is useable, player can Press RMB on inventory slot to show the menu and use the item. He also can place item to Fast menu and press the number on his keyboard to use. I also add ability to make your own item blueprints with unique logic and Use function. You must create BP based on ItemBP and then just setup Inventory info in Details panel. I will post the video soon, so you can see the result of my work. The main functionality is done, so Inventory is almost finished. All I have to do is comment my BPs and fix some stuff. I hope you guys will support me before and after I submit it on market!! Ill work on it whole week, so Im planning to finish Inventory before 2015! New screenshots and new video in first post. Oh, and.. HAPPY NEW YEAR guys!! Have you submitted it to Trello to get the votes for the Marketplace? Just watched the YT Video...I'm seriously drooling right now and I am like "****!". I mean, it looks feature rich and easy to set up. Amazing work! Last edited by Maxunit; 01-02-2015, 02:04 PM. Yes, I've submitted it, but Epic have to check it before it goes to Trello boards. I'm looking forward to get their reply and when I do, I'll post it here. Pretty awesome setup. Guessing its not multiplayer though? Right now it's Single only, yes. But I'm planning to add multiplayer support after release(of cource the price will be same). I'd honestly charge more after implementing that. Not sure if you've dealt with replication yet but it's a huge headache. Personally I'd suggest making it so everyone who buys your single player version gets the update for free but any new buyers pay a higher price. Just my 2 cents though.